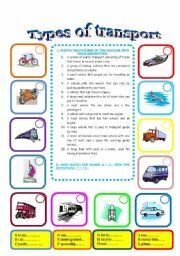 This is a worksheet with two exercises to practise transport vocabulary. Thank you very much to moroccan_teacher for the template. It´s been really useful!!!!! Hope u like it too!!!!! I tried a black and white version, but it was impossible to upload because of size. 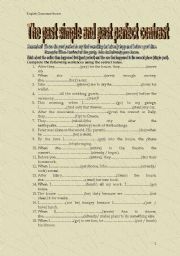 This is a worksheet to practise vocabulary when going shopping. You´ve got a questionnaire to see if students are shopaholic and talk about their results. Key included. Thanks to bruna_dutra for the template. 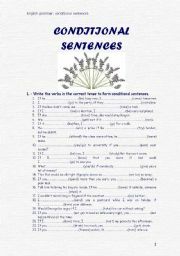 A simple worksheet to practise conditional sentences (type III). It´s fully editable and with answers. I hope you find it useful. 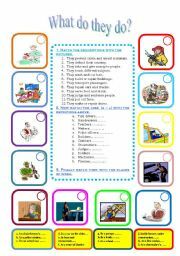 Another easy worksheet for elementary or intemediate students to practise professions through three types of exercises:a.matching, definitions and pictures;b. jobs and c. places of work. Thanks moroccan_teacher for the template again. Hope u like it! 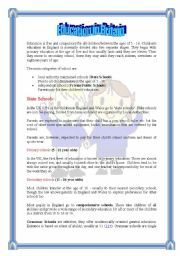 This is an easy reading about educational system in Britain. 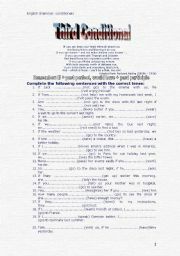 I´ve found the information on http://www.woodlands-junior.kent.sch.uk/, but it´s adapted and I´ve done the comprehension and vocabulary exercises. Hope it´s useful for you too!! Another reading for younger students. They were interested in the topic, so I hope it will be useful for you too. Thanks to baiba for the template. 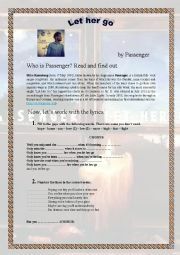 This is a worksheet to work with this nice song. My students liked it a lot and it´s quite easy to understand. You´ve got the youtube link to watch the video too. Hope you like it. 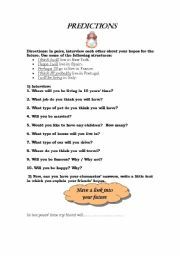 A pairwork activity to review the use of will to make predictions and talk about the future.